The launch of 435 new national and local DAB transmitters was celebrated this week (28 March 17) during the Digital Radio Stakeholders’ Event at the headquarters of the Society of Motor Manufacturers and Traders (SMMT) in London. The additional transmitters have transformed the availability of DAB across the UK bringing 10 million more adults into coverage for local DAB stations and 1.5 million more adults into coverage for BBC national DAB stations. The DAB expansion has brought an additional 7,000 kilometres of the UK road network into coverage for local DAB stations and 2,300 kilometres of roads for the BBC national DAB stations. 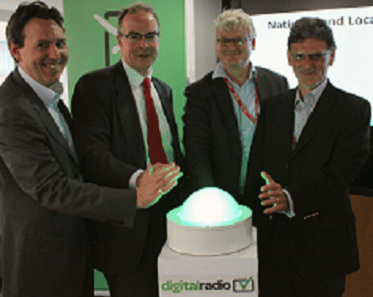 During the event, senior representatives from four of the key stakeholders involved in the expansion of DAB coverage - Robin Holmes, BBC; Grae Allan, Bauer; Glyn Jones, Arqiva and Ian O’Neill of DCMS - pressed the big green digital radio switch to mark the progress made. Over 200 DAB transmitters have been built to expand coverage of local DAB stations from 75% to 90% of UK households in a programme of work co-funded by local commercial radio stations and multiplex operators, BBC and DCMS and coordinated by Ofcom. Local DAB coverage is now widely equivalent to FM coverage of local commercial stations, meeting the DCMS local coverage criteria for switchover. During the meeting it was confirmed that the local DAB expansion programme is largely complete with the last remaining few transmitters to launch by the summer. In total, 14 new local DAB multiplexes have launched over the last four years and there are now 53 local DAB multiplexes which collectively carry 419 local stations including 45 of the BBC’s network of 46 BBC Local and Nations radio stations. Alongside the expansion of local DAB coverage, national coverage of BBC and commercial services has also seen a step change since 2013. The BBC has launched 161 new transmitters on its national DAB multiplex, bringing BBC Radio’s national network of 11 stations to 97% of UK households on DAB and providing more robust coverage for 26% of homes or 13.6 million adults. New transmitters have also been built to support the two national commercial DAB networks, Digital One and Sound Digital. Sound Digital, which launched in March 2016, was built to serve 77% of UK households, and now carries 19 stations, whilst Digital One’s coverage has been expanded to 91% of the UK and now carries 13 stations, including the newly launched Heart 80s from Global. During the meeting, Digital Radio UK unveiled the new spring digital radio consumer campaign which highlights that DAB coverage is now available to over 90% of households and prompts listeners to reconsider digital radio with the message, ‘if you think you know digital radio – think again.’ The campaign launches on Wednesday 29 March across national and local commercial radio stations.